The only language in the world in use in five different scriptseven in the babel of India's 122 major languages, Konkani is unique. But does it have a future? Install her on the throne!" —My Language from Sudhir Sukta by Vishnu Surya Wagh, translated from Konkani by Augusto Pinto. Still recuperating after a devastating heart attack, the outspoken Goan politician, dramatist and writer Vishnu Surya Wagh has managed to trigger the most potent maelstrom to roil the world of Konkani literature in several decades. His 2013 collection of poems, Sudhir Sukta, had been finalized to receive this year’s Goa Konkani Academy award, before one jury member leaked the results in protest. Sanjiv Verenkar explained: “My intention was the greater good. These poems are critical of a particular community and have the potential to stoke communal tension." Overnight, heated attacks proliferated, including an unsigned screed in the establishment-oriented Navhind Times, which labelled Wagh’s work “a harsh attack on the members of the Saraswat community, their traditions, rituals, and even their religious head, by using filthiest language. The poems paint Saraswats as those responsible for all the atrocities committed on various other local communities." Uday Bhembre, the veteran Konkani writer and former leader of the language agitations of the 1980s, warned, “Such a thing could set a precedent, in turn bringing forth more such books and creating a divide between communities who lived in harmony till now." The controversy over Wagh’s poems brings to the fore cultural fault lines that usually lie just below the surface of Goa’s famously egalitarian society. Particularly fraught is the question of ownership of Konkani, which has the most complicated and contradictory history of any Indian language. Kaustubh Naik, the ailing poet’s nephew and outstanding young research scholar at Jawaharlal Nehru University in Delhi, neatly summarizes the issue: “All this perfectly symbolizes a shift in the ownership of the language from upper castes to a more democratic cultural expression. Wagh does not rely on the heavily Sanskritized vocabulary of Devanagiri Konkani. Instead, these poems challenge and displace Brahminical locations." Even amidst the babel of the Census of India’s 122 major languages, Konkani stands out as unique. Its undisputed homeland is Goa, but four times as many native speakers live outside the state. It is the only language in the world in everyday use in five different scripts: Devanagiri, Malayalam, Kannada, Arabic and Latin (aka Romi). It barely survived a crippling ban by the Portuguese in the 17th century, only to emerge and navigate another bitter existential struggle to define itself separately from Marathi, which extended through generations before its confirmation as an official Indian language in the Eighth Schedule of the Constitution in 1992, alongside Manipuri and Nepali. The Konkani diaspora is highly distinctive, including, variously, the fathers of the current prime ministers of both Ireland and Portugal, three members of parliament in the UK, the 2016 winner of the prestigious Sprakprisen prize for excellence in Norwegian prose, and at least 40,000 “Kokni" Muslims, who have lived for a century in South Africa’s Cape Town. This singular global history has its roots in colonialism, which has been both the making and unmaking of Konkani. The initial period of Portuguese rule centred on Goa witnessed a determined attempt to eradicate the language of the locals. But since these strictures were accompanied by new technology and ideas, Konkani became the first Asian language ever printed, in the first volume published by the first press set up in the continent, in Goa in 1556. Later, the first modern grammar book of any Indian language was Arte da Lingoa Canarim, published in 1640 by pioneering English Jesuit Thomas Stephens. By the middle of the 17th century, there was a substantial body of Konkani literature in print, described by Fordham University’s late polymathic linguist and scholar Jose Pereira as “a great achievement...far in advance of any modern Indian tongue". Waves of migrants radiated from the Konkani heartland in Goa for a thousand years, but the most sustained exodus was compelled by the Inquisition, from 1560-1820. 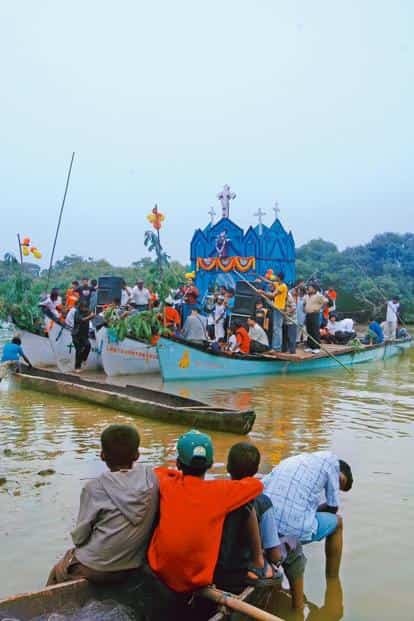 A sizeable proportion of the territory’s Konkani-speaking residents fled south, including large numbers of converts to Christianity, like the community today called “Mangaloreans". In 1684, the native language was banned, with even its verbal use proscribed. All available manuscripts were destroyed. It was a crippling blow to the language, which only began to limp back after Portugal experienced a landmark liberal revolution, and loosened its grip on Goans via its new Constitution in 1822. From that date, until the fascist dictator Antonio Salazar rose to power in Portugal in 1928, Goans enjoyed a unique heyday of native republicanism, extremely unlike the experience of the rest of India under British rule. A common civil code granted identical rights and freedoms to everyone, regardless of caste or creed. Uniquely Goan cultural expression in Konkani (as well as Marathi and Portuguese) began to thrive. In 1889, Eduardo José Bruno de Souza launched the first Konkani periodical, Udetenchem Sallok, exulting, “As on a lake, limpid like a mirror, blooms a beautiful lotus and spreads its fragrance around, so does this Lotus of the East rise in the midst of our people…man cannot live without companionship and no companionship can flourish without language." The next year, he published the first Konkani novel. In 1892, the first Konkani tiatr, combining European musical theatre forms with Goan character archetypes, was produced by Lucasinho Ribeiro in Mumbai. Meanwhile, the beautifully hybrid dance and song form of the Konkani mando flourished, an artful blend of 18th century Western European minuets and contredance, practised with no-touching Indian social conventions. The Goan “native language" was firmly back in hearts and homes, but its literature remained moribund. An attempt at a renaissance came in 1858, from Joaquim Heliodoro da Cunha Rivara, an Orientalist Portuguese official who recommended “methodical cultivation of the mother tongue", saying, “It is true that the enterprise is not easy, but it is useful, it is decorous, and it is glorious." He attempted to propagate Konkani-medium schools, but these were quashed by lobbies preferring the status quo. The seedbed for Konkani’s contemporary revival was nourished in the diaspora, keyed by Vaman Varde Valauliker (aka Shenoi Goembab). He wrote tirelessly in multiple genres, with a monumental impact on his language. With lasting significance, he recommended, “Let us not divide (Konkani) into the speech of the higher classes and the speech of the lower classes, scholar’s speech and the farmer’s speech. Let us make the farmer a scholar, and let us all become scholars, and let us all enjoy the full independence of the Konkani language." In 1942, even as World War II raged, representatives of the various Konkani-speaking communities gathered in Bombay (now Mumbai) for an All India Konkani Parishad. These passionate advocates, including Shenoi Goembab, the brilliant poet Bakibab Borkar, and fiery nationalist “Gandhi priest" Hubert Olympio Mascarenhas, agreed that “a permanent organization is needed to further the cause", and created what would become the predominant advocate for Konkani cultural heritage. The Konkani Bhasha Mandal’s first president was Dharwad-based poet and educationist Armando Menezes (who happens to be my grandfather). Years of steady campaigning led to a Konkani section of All India Radio being established in 1952, inspiring Radio Lisbon to follow suit in 1955. These were both important milestones in the rebirth of Konkani. On 19 December 1961, the contemporary chapters in Konkani’s lengthy history were kick-started by the mercifully brief decapitation of the 451-year-old colonial state in Goa. Almost immediately, Goa’s newly democratic polity turned turbulent, with tremendous angst and anxiety over Konkani’s status, as its first elected government was formed by Dayanand Bandodkar’s Maharashtrawadi Gomantak Party, which favoured merger with Maharashtra. Inverting the old adage, “a language is a dialect with an army", forceful arguments were now advanced by legions of purported authorities that Konkani was merely a dialect of Marathi. Arrayed on the other side was an equally vehement camp, including the Konkani Bhasha Mandal. Armando Menezes declaimed with righteous ire, “In the welter of corruption and venality and unenlightened despotism and second-fiddling and His Master’s Voice bluster that is going on in this ‘district’ of Goa…(the biggest lie) is that the language of Goans is Marathi. Some of our most vocal Goans say it, keep on monotonously saying it, and say it in excellent Konkani, or, generally, in bad Marathi." Goans rejected the merger in a dramatic referendum in 1967 that set the Union territory on the track to statehood, which it finally got in 1987. But linguistic conflict never dissipated. In 1970, Bandodkar made Konkani Goa’s official language but specified “in Devanagiri script", a framing that was immediately adopted by the Sahitya Akademi. The unnecessary and unwarranted hair-splitting overnight cleaved apart previously aligned “Konkaniwadis". Kaustubh Naik says: “Konkani writing in Goa, historically, has been through the Roman script. But that culture was completely sidelined when the official language Act explicitly defined Konkani as written in Devanagari script only. This invalidated centuries of writing in Romi." Naik says, “Two linguistic cultures—Romi Konkani and Marathi—that were in practice in Goa for centuries were rendered invalid when Nagri (Devanagari) Konkani became fixed as the ‘authentic’ marker of Goan identity. Marathi had opened up access to upward mobility for a lot of bahujan communities from Goa. It also has been the language of devotion for the bahujan masses. What this Konkani victory has effectively done is to render Goan Hindu Saraswats and their culture as the true and unadulterated vehicle of Goan identity, and Marathi and Romi Konkani are seen as corruptions within this narrative." Naik’s friend and colleague, and another of Goa’s brightest young scholars, Dale Luis Menezes, says: “After India’s takeover of Goa, Romi acquired significance in terms of political expedience. Catholics sought to avoid marginalization by Hindu majoritarian politics by galvanizing for Konkani (with an understanding that Romi too would be protected) so that their identity would be safeguarded. However, with language politics being unfairly tipped in favour of Nagri Konkani and its largely Hindu upper-caste votaries, there has been a growing sense that Romi Konkani politics has failed." The eminent writer and novelist Damodar Mauzo has authored some of the most acclaimed works in Konkani literature. But now he’s frustrated, saying “politicians have had their way in dividing people, and we Goans have ourselves continued to work in isolation in two different scripts". He’s convinced “much more productive work is being undertaken in Mangaluru. If we continue to remain apathetic and divided, our Karnataka counterparts will lead the movement. Personally, I would appreciate it." Despite internecine tensions, on most days in Goa it’s actually impossible to tell that Konkani is a language in crisis. It’s ubiquitous in street and marketplace interactions to a much greater degree than, say, Kannada in Bengaluru. The rival literary academies of Romi and Devanagiri keep promoting new books, and the standard of output is improving conspicuously all the time. Tiatr is booming, with sell-out successes that include overseas tours to diaspora hotbeds in the UK, Canada, France and the Gulf states. Konkani cinema too is prospering. The lush, nostalgic 2014 musical Nachiom-ia Kumpasar won several national and international awards. Its director, Bardroy Barretto, says: “The love and support for my movie wouldn’t have been possible without Konkani. The loyalty to the language is our greatest strength." Veteran journalist Ashok Row Kavi, who covered the Konkani language agitations all through the 1980s, marvels at the change since then. “Once Goans developed a strong body of literature, drama and songs in Konkani, this ‘critical mass’ put paid to any effort by Marathi to absorb Konkani within its cultural ethos. Goan Konkani is a more powerful medium precisely because it is out of the hands of the elite and in the hands and lives of the common people. That’s how beautiful the journey of Konkani is." The star of Barretto’s instant classic movie is the eclectic, soulful pop music created by Chris Perry, and a host of his countrymen and women, who together—writer and cultural historian Naresh Fernandes says—“created the sound of Bollywood" in the 1960s and 1970s. These songs are timeless, iconic and probably the most consequential achievement of Konkani culture. On any given day, no matter what the time, you can twirl the radio dial in Goa to reliably find the signature smoky voices, those supremely satisfying trumpet and saxophone grooves. There will be Lorna Cordeiro, in her own way every bit as iconic to Konkani as Édith Piaf is to French. Do yourself a favour, give in to the mood. No one knows what will happen to Konkani in the future, but this moment in time is surpassingly beautiful. Sorga Rajeant: A slow-burning lamentation, full of longing and regret, this is a classic torch song in the grand tradition of Édith Piaf and Judy Garland. Nachomia Kumpassar: Pure Konkani rock ‘n’ roll, reflecting Perry’s eclectic tastes and uncanny ear, as well as Lorna’s ability to rear back and deliver an old-fashioned belter. Calangute: This might be the most popular Lorna/Chris song. With its sweet backing vocals, and Lorna’s instrument at its soaring best, these lyrics stir Goan heartstrings like no other. This is the first in a series that takes stock of the neglect of languages and the attempts to revitalize them.